We are a grassroots school of healing & yoga, giving people the tools to keep themselves, their families and friends healthy, fit, balanced & empowered. We also teach people George King’s Yoga tools, a combination of Bhakti & Karma Yoga to actively work for world Peace. On the one hand we teach Self-Healing, to replenish our own vessel and on the other Planetary Healing techniques to enable us to change the world for the better. We pour the love from our continuously replenishing vessel out to the world. 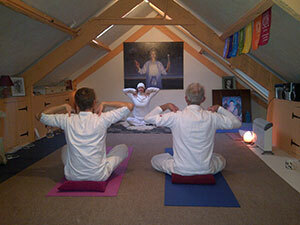 At the moment Katherine's Camino Orientation Consultations, Stewart's Kundalini Yoga Classes & Private Yoga classes are the practical options as part of the school that we offer to help people improve the quality of their lives. Katherine teaches in such a way as to empower individuals, families and friends to help themselves and take responsibility for their own healing. She runs ‘apprentice style groups’ as the demand arises. She enjoys sharing and teaching 'self-care' healing tools so that everyone can feel able to enjoy a better level of health and wellness and overcome mild or debilitating illness which seems to affect so many people in this age. Our sister company 'Mother Earth's Minerals' was also set up to help people to improve their health by remineralising their soil & growing fully vibrant fruit & vegetables.